Known as the plushest short travel cross-country race bike in creation, for 2011 the Hei Hei 100 grows into its golden age. Designed to go quick over rough terrain, in inclement conditions, driven by a committed engine (you), the light and lively Scandium Hei Hei 100 is all good all the time. A new frame design features a tapered steer tube and integrated headset, with smaller links, more standover, a shorter stem, a longer head tube, and an offset seatpost for a balanced riding position. Remote fork lockout, 10-speed transmission, and a Kona custom XC/BC handlebar create the sweetest mountain bike in mountainville. Sizes 16", 17",18", 19", 20", 22"
Since Kona first introduced the platform in 1996, we've been refining and honing the most functional, durable and performance-oriented dual suspension platforms ever invented. That's why you see versions of our 4-Bar linkage on everything from the Hei Hei XC Race bike to our DH Stab Supreme. Function and Durability: Anytime you have a pivot in anything, there is side-to-side movement, or tolerance. It's what allows the pivot to move freely. When you have pivots that are close together, like in more complicated multi-pivot designs, the side-to-side movement in those pivots becomes amplified, what's called tolerance stacking. Kona's 4-Bar system keeps pivots as far away from each other as possible, thus minimizing tolerance stacking. Ultimately, it equates a stiffer rear end, as well a significant decrease in bearing and bushing wear. Another benefit of our 4-Bar system is minimized side load on the rear shock. If you've got close pivot points and/or the shock positioned so that it is exposed to lateral forces, you've got side load on the shock. Side load causes resistance, which negatively impacts suspension performance. Side load also causes premature seal failures. With our 4-Bar system the rear shock is protected from side-to-side forces. As a result, we have a super low rate of shock problems, as well as a very responsive feel to the rear suspension. Tunability: 4-Bar allows for a rainbow of different suspension characteristics, after all, this is the suspension platform used for F1 racecars. For XC bikes, we can take an inherently progressive air shock and make the suspension more linear, allowing the rider to benefit from all of the bike's travel. For downhill bikes, like our Operators, an inherently linear coil shock can be set-up to be more progressive for big hits. Plush Factor: Void of gimmicks, with pivots, bearings and the shock itself well supported, Kona's Walking Beam 4-Bar Linkage System delivers that beautiful, super plush feel we all crave as mountain bikers. Whether it's taking the edge of a technical XC race course, the burl out of a backcountry all-day epic, or smoothing the brake bumps at your local bike park, our 4-Bar suspension designs deliver bomber plushness, ride in, ride out. Known to be one of the lightest and strongest alloys in the world, with superior ride characteristics, Kona Race Light Scandium is featured in many of our high-end bike models - from dual suspension mountain bikes through to some of our top ranking asphalt bikes. Scandium is a potent grain refiner that when added to aluminum alloys, elevates the strength and durability of the material by 50%. It accomplishes this by aligning the grains of the alloy, making the metal less susceptible to failure. Kona Race Light Scandium alloy is twice as strong as 6061 or 7005 aluminum, allowing our engineers to use much less material. Because of the material's strength, it can be butted thin enough to give the aluminum a more compliant ride similar to steel but without weight. In more specific terms, we're shaving weight from our aluminum frames by 10-to-15%, without sacrificing strength and durability. For 2011 you'll find Kona Race Light Scandium sprinkled throughout our entire line of bikes. Most notably, our Abra Cadabra 100-160mm variable travel backcountry bike uses a Scandium frame, a testament to our commitment and faith in one of the world's most rigorous materials. Kona recognized the advantages of sloping top tube frame design right from the original models we made in 1988, designed by inaugural MTB Hall of Fame legend Joe Murray. As a company, we've stayed true to this philosophy, going so far as to pioneer the design in road bikes before the benefits were understood. Today, you'll find sloping top tubes in most high-end road race bicycles. We've since stayed true to all the many positives this design brings to overall bike performance and comfort. First, this design allows the top tube to be lower, providing more room for correct positioning and free body movement, enabling more standover clearance, which is particularly useful on dual suspension bikes that have higher bottom brackets. Riders have a more secure riding position, which is especially beneficial when riding downhill sections. Also, the top tube is longer and more compliant. As the top and down tube become more parallel, there's less triangulation, resulting in more compliancy. So not only is the frame stronger and more responsive, but it absorbs more shock than frames with horizontal top tubes. Short chain stays and seat stays provide a perfect balance of stability and power transfer when out of the saddle and pedaling hard. Shorter seat stays also have less deflection during braking and accelerate quicker than longer stays. The shorter rear triangle also helps the bike to negotiate tight twisting sections of trail. For 2011, you'll find formed tubing on a great number of our bicycles. Hydroforming uses water specifically, but we also use Superplastic formed tubing, shaped using air, or cold formed tubing. This not only allows a tube to be tuned for compliancy on specific planes but it also improves grain alignment and increases all mechanical properties. Hydroforming is a tube shaping technology that uses super high-pressure liquid to form the shape of a tube and align its grain structure. Quite simply, the technology delivers a sound structure and ride performance like no other tubing in the world. The process results in a seamless, continuous, aligned piece of metal-right down to the fiber structure itself. Hydroforming proves especially advantageous at weld points where it can be flared to increase weld areas, adding strength without adding weight in the form of extra gussets. The result is a strong, flawless frame with great lateral stability, durability and responsiveness. Not to mention, it looks real sharp too. By having the headset bearing located inside the headtube (what's sometimes called zero stack), rather than the top and bottom, we are able to achieve a wide array of advantages when it comes to front end stiffness and overall riding performance. With an internal headset, the head tube is able to take the stress directly, resulting in less play and less wear, with strong ride characteristics, and better bearing performance. An internal headset also reduces stack height, enabling the height of the stem and bars to be more adjustable, the bike has more setup options, resulting in the best fit possible. For 2011, a wide variety of Kona bicycles feature tapered head tubes, meaning the top of the head tube is 1-1/8-inches at the top, while the bottom is 1.5-inches. From our cyclocross bikes to our cross-country mountain bikes, right through to longer travel dual suspension models, like our Cadabras and CoilAirs, a tapered head tube provides more support at the intersection of the top tube and down tube. The design also offers a more solid interface between forks with tapered steer tubes and the bicycle frame itself. More girth at the bottom of the head tube better distributes shock force, prolonging the bearing life of the headset itself. The design also allows for a stronger steering position and improved balance, giving the rider more control in rough terrain. When a rider puts force into the bicycles drivetrain (cranks, chain and rear cassette), not only are they propelling the bike forward, they're also putting a significant amount of torsion on the rear chain stays. Because the drivetrain is on one side of the bicycle, the frame wants to flex laterally. It is the one element of bike design that's not in perfect balance. Used primarily on our dual suspension mountain bikes, asymmetrical stays help to stiffen the rear end by compensating for the offset forces of this imbalance. The drive-side stay is straight, while the non-drive takes advantage of no chain rings and chain, better able to deal with the torque, effectively countering the torsional forces in the rear triangle. By putting strength where it is needed, pedaling stiffness and rider efficiency is greatly increased. Sizing and fit have always been one of the main strengths of the Kona range, with more stock sizes available than any other bike company. With our range of bicycles expanding significantly over the last couple of years, we felt it was time to overhaul our size scale. We started with the overwhelming request for longer top tubes on our XC mountain bikes. The average increase is ½-inch (15-20mm), which we coupled with shorter stems and slightly shorter headset stack heights. The steps between sizes were evened out to ½-inch or 1-inch increments, and there are still up to 7 sizes: from 14-inch to 22-inch on many models. In the asphalt range, top tube lengths were marginally lengthened, with the size gaps revised to even 15 to 20mm steps. There are still up to 6 sizes" from 46cm to 61cm on most models. When it's called for, seat posts are either offset or straight to maximize the reach and power output of the rider. More importantly, the overall sizing on mountain bikes and road bikes allow Kona dealers and riders to determine their fit more easily from model to model and category to category. The net result is better fit on the entire range, with a simplified system that allows easy fine-tuning and a perfect marriage of bike and rider throughout our entire 2011 range. Kona warrants to the original owner that the frame of this new Kona bicycle purchased from an authorized Kona dealer shall be free of defective materials or workmanship for the lifetime of ownership by the original owner. Carbon frames have a 5 year warranty. During this warranty period, Kona shall repair or replace, at its sole option, the bicycle frame if Kona determines the frame is defective and subject to this limited warranty. The original owner shall pay all labor and shipping charges connected with the repair or replacement of the bicycle frame. Please see the Kona Owners manual provided with your bicycle for additional information. Of course you don't just want to hear about how great we think our bikes are. Get unbiased opinions, and read about our bikes in the real world, as magazine editors, writers and gear reviewers run our wares through the ringer. Below is an up-to-date listing of all current web and print reviews. Ute review in Bike & Trekking (NL) Fijne Fiets, die Ute! Kula Lisa reviewed on The Bike List This bike really is a dream to ride. I’ve been testing this bike out on my local trails and I don’t want to give it back! Paddy Wagon reviewed on cycling.tv This is a solid entry level single speed/fixed bike which is ideal for the commuter. Jake review in What Mountain Bike magazine An adaptable go-anywhere all-rounder that's both competent off-road and a sturdy option for touring or commuting. 2011 Abra Cadabra previewed in MBR UK magazine There is no denying that the 2011 Abra Cadabra is a step in the right direction. Sutra review on road.cc The Kona Sutra is an awesome package. Lisa RD review on thebikelist.co.uk ...this is a reliable, strong ride with a hoard of quality components that will last you for years. Major Jake review on cxmagazine.com ...the new 2011 Kona Jakes are taking things to a lower level, in weight anyway, and giving the Kona duo a leg up on the competition. Abra Cadabra review on Singletracks.com It’s unlike any other suspension set-up you’ve ridden - it’s like magic! Abra Cadabra review in Singletrack Magazine It's well worth a play and perhaps someday, all bikes will end up like this. Abra Cadabra review in Dirt Rag Magazine ....the Abra Cadabra was a joy to ride....comes alive as your speed increases...gobbles up rough and flowy sections of trail with equal prowess....I'd certainly be happy with this bike in my quiver. AfricaBike review on Treehugger.com The Kona AfricaBikes are specifically designed to be light-weight, unbelievably durable, and easy to maintain. Basically, the bikes are built to go wherever needed, including off-road through dirt, rocks and mud. Band Wagon review on bikemonkey.com Deluxe! That's the Cadillac of bikes, young man!" Cadabra review in Tutto MTB (IT) un'ottima trail bike a lunga escursione, con un leggero telaio in lega allo scandio e una sospensione posteriore efficiente, una delle migliori per i Single track goduriosi ! Cinder Cone review in The Bicycle Buyer We loved the smooth welds on the front end of the frame making it look much more expensive than the actual price tag, very classy. We also loved the simple bold graphics and colours which co-ordinated well with the component parts. The Kona is also the only bike we tested available in 1" increment sizes, allowing a more precise fit. A flawless ride, no surprises good or bad, what you see is what you get. CoilAir review in Bike magazine The CoilAir is exceptionally stable and the suspension, damn near bottomless. Nice. If you're looking to tackle seriously big and punishing terrain that requires some honest pedaling to the top, the CoilAir delivers...and then some. CoilAir review in Decline magazine A Special blend of all around ability and superb descending talent. Dew FS review on bikecarson.com The upright riding position is comfortable on your back and neck, and you have great visibility of traffic and other things that are going on around you. Dr Fine review on velotaf.com (FR) Le cadre est vif et joueur. Le poste de pilotage, vraiment très haut d'origine, accentue presque excessivement cette vivacité. Hei Hei 100 review on singletrack.com An excellent bike overall. It felt stiff, fast and predictable and is easily handled on all terrain. Hei Hei 29 review on BikeWorks of Lake Stevens Personally I think this is Kona's best offering yet in the 29'r category. Hei Hei 29 review on bikemag.com I've flogged the hell out of this bike, on trails that have a reputation for ruining machines, it is still running like a top. Hei Hei 29 review on singletracks.com With lightweight, hydroformed scandium tubing, race-ready geometry, and a solid XC component mix, this bike will let you rocket down the trail for hours on end. Jake the Snake review on bikehugger.com I have to say it was a good step up over similar setups I’ve ridden. Kahuna review in Bike & Trekking magazine Even los, de Kahuna is en dijk van een fiets. Degelijk, origeneel en met de moiste kleur. One 20 review in Bike Magazine France le Kona One 20 est le vélo idéal pour une majorité de vététistes avides d'évasion et d'amusement. One20 Deluxe review on singletrack.com It has great pickup on small chatter, and likewise the big hits disappear. It's very plush in general. Paddy Wagon review in Cycling Weekly UK Why not ride a fast, efficient bike that looks absolutely brilliant? And that's just what Kona has given us. Sutra review on Outside online I grew so attached to my green Kona Sutra... that when I had to break her up and ship her home I almost cried at the thought of a five day separation. Ute review in Momentum The long wheelbase of the Kona UTE allows for a lot more carrying capacity. Bass review on whistlermountainbike.com The Bass was super fun to ride, with the short chain stays it showed us new lines on trails that we hadn't seen before. Bass review in BIGBIKE Le velo excelle par sa tolerance et sa facilite sur les sauts, ideal pour les lignes rapides et engagees en bike park. Bass review in Mountain Biking UK £1000 gets you a lot of bike that will thrash the dirt jumps and stand up to slopestyle. Blast Deluxe review in MBR Magazine ...Inspires plenty of confidence when letting it all hang out...a sprightly-feeling ride. Coilair Deluxe review in Mountain Bike Plus (dutch) vanaf 2000 Euro koop je een redelijke Enduro. Wil je er meer mee klimmen (en dus een lichtere bike dan zit je eerder in de 3000 Euro-klasse). CoilAir Supreme review in BIGBIKE C'est une super bike d'enduro, hyper amusant a piloter grace a sa grande vivacite et maniabilite, et efficace grace a ses excellentes suspensions. Le fonctionnement du Magic Link est imperceptible dans le feu de l'action. CoilAir Supreme review on x-aces.com (german) Kona CoilAir Supreme 2009 – ein sehr vielseitiges Bike, welches durch das Magic Link System sein Potential sowohl beim Uphill als auch beim Downhill spürbar verbessert. Mit dem Kona CoilAir Supreme bekommt der Käufer somit ein wirklich sehr vielseitiges Bike, das bergab mehr Reserven bietet, ohne bergauf langsamer zu werden, zumindest bei einem runden Tritt. Dawg Supreme review on cyclingnews.com this is a not a bike to be handled gently, it likes to be grabbed by the scruff of its neck and hauled into place – and then whoops down like a two-wheeled armchair , soaking up everything in its path. Dawg Supreme review in BIGBIKE Le velo colle parfaitement au programme, a l'aise sur les terrains technique, autant en montee qu'en descente, ou il se montre aussi ludique qu'efficace. Un all-mountain tres reussi, pour les adeptes des sorties musclees en montagne. Dawg Supreme review in CICLISMO (IT) Bella bike, leggera e divertente. Ottima per un uso Back Country e All Mountain anche esasperato!! Dawg Supreme review in Mountain Biking UK A bike that feels right from the off and let's you just get on with the business of thrashing it. Dawg Supreme review on gear.com Every Kona I've ridden has just plain worked and worked well. Dawg Supreme review on feedthehabit.com you'll instantly fall in love with the way the Dawg simply devours the downhill. Five-O Deluxe review in Mountain Biking UK The Five-O is a great play bike that's extremely competant on XC trails. It's happy on hard, fast descents and can handle moderate abuse too. Hei Hei review in Mountain Bike Plus WAT EEN MOOI FRAME! Hei Hei review in What Mountain Bike This is a very rapid & enjoyable ride. King Kahuna (2-9ER) review in Mountain Biking UK Excellent - One of the best wagon wheelers we've ridden. King Kahuna (2-9ER) review on mtnbikeriders.com ...a durable well rounded bike that can withstand some hard trail riding while also easily slipping into the racer mode if you so desired. Kula Deluxe review in What Mountain Bike A phenomenally committed climbing and race bike that's impressive on descents too. Kula review in What Mountain Bike Out of the box the ride feel is sweet. Lisa 120 Deluxe review on dirtragmag.com I was pleasantly surprised to find this bike felt instantly familiar and comfortable. Lisa TR review in 220 Triathlon The Kona Lisa is a solid investment and holds its own at this pricepoint. Minxy review in BIKE Mag. The Minxy is a solid purchase for a girl wanting to push her limits on a predictable and plush bike. One20 review on bikeradar.com Slack but balanced budget bouncer is a blast. One20 Deluxe review in BIGBIKE Le velo se tourne vers une pratique sportive plus XC que rando, dont la position allongee est parfaite pour rouler vite sur le plat et en montee. Stab Supreme review in BIGBIKE C'est une arme en competition, dote de suspensions efficaces et concu pour rouler vite. Il est plus taille pour les parcours rapides que pour les parcours lents et techniques. Il est fait pour les riders qui recherchent un velo tres stable et tres bien suspendu. Stinky Air review in Ciclismo magazine Stinky Air è una delle novità "forti" della gamma Kona 2009. Stinky Air review in BIGBIKE Ce cadre est excellent, avec une bonne geometrie et au comportement tres joueur, ideal pour les riders voulant un velo de freeride pas trop lourd. Supreme Gloves review in Dirt Rag Kona's Supreme mesh-paneled glove provides maximum airflow along with all the characteristics that make a great glove. Unit review on CourierPostOnline.com It handles bumps well considering it's fully rigid, can accelerate, climbs like a champ and carries momentum over obstacles. Ute review on bikeradar.com Kona is getting involved early, bringing more legitimacy (and a worldwide dealer market) to the cause. Ute review on Outside online This is my favorite, and I've ridden more than a few cargo bikes over the last six years or so. Ute review on bikecarson.com I've only yet begun to use the Ute to its full potential, but I was pretty pleased with this particular cargo. It was by no means a heavy load, but the awkwardness of it probably would've made me drive if I didn't have the cargo bike. The Dr. Dew Files - Episode #4 - Built To Last review on mtbr.com The Doctor is at it again. This time he pounds the pavement and trails in search of old Konas that have stood the test of time. The front tube of the frame, through which the fork steerer passes. 1.5" head tubes have a larger diameter than standard 1-1/8" head tubes to accommodate larger fork steerers and headsets which are known to be stronger and more impact resistant. Refers to the wheel size of the bicycle. In this case, the wheels are 29-inches in diameter. Standard wheels sizes on mountain bikes are typically 26-inches. There is much debate as to which standard is better, but with all the pluses and negatives, we find it comes down to preference. A relatively new style of mountain bike racing where four bikers race downhill on a prepared, BMX like track, simply trying to get down first. These bikes are generally either full suspension with 3 to 4 inches of travel, or hardtails, and have, typically, very strong frames. The bicycle regarded as the most important one ever made by Kona. All AfricaBikes sold directly to consumers fund the production of bikes donated to African healthcare workers and programs to fight disease and improve the quality of life in developing countries. For every two AfricaBikes sold, Kona donates one complete bicycle to charities of our choice. Visit www.bongobongo.com or KonaAfricaBike.com for more information. A suspension shock that is sprung using compressed air. Suspension characteristics like rebound (how fast the shock rebounds from being compressed) and compression (how fast the shock compresses) also use air along with oil. An all-mountain bike is a mountain bike built to excel at virtually any type of riding condition a mountain biker might encounter. Kona All-Mountain bikes have between 140mm to 150mm of travel. These bikes are designed to climb extremely well, while still being effectively set up and strong enough to descend well also. Aluminum is one of the most widely used tubing materials in the bicycle industry. The material is mixed with other elements creating alloys with different ride characteristics and properties. 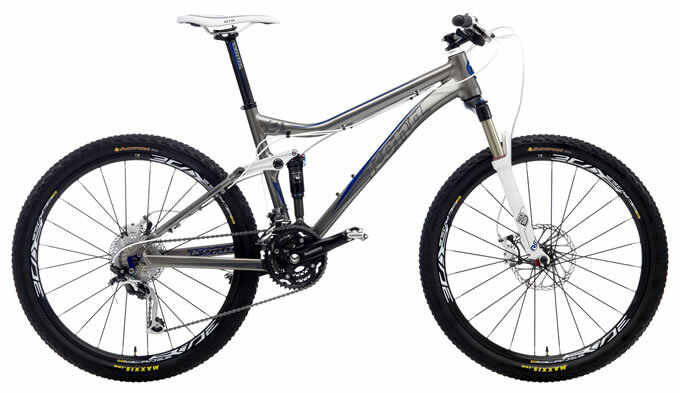 Kona uses butted 7005 aluminum extensively throughout its range of bicycles as well as Scandium, another aluminum alloy that is extremely strong and light. The term used at Kona to describe all types of city, commuting and getting around types of riding and the bicycles for those applications. Not to be confused with street riding. An all-mountain bike is a mountain bike built to excel at virtually any type of riding condition a mountain biker might encounter on a ride. Kona All-Mountain bikes have between 140mm to 150mm of travel. These bikes are designed to climb extremely well, while still being effectively set up and strong enough to descend well also. A ring that is bolted to the chainrings that acts to protect that chain from obstables one might encounter in more aggressive types of riding, or also just to protect clothing from being sullied or entagled between the chainrings and chain. The bottom bracket is the part of a bicycle's frame around which the cranks and pedals revolve though an assembly of bearings and the axle. The height of the bottom braket affects obstable clearance, but also affects pedal clearance in cornering and some of the bike's overall handling abilities. At Kona our groupings or families of bikes are termed Platforms. One platform differs from the other by the application the bikes are meant for. Backcountry and Asphalt are examples of Kona bicycle platforms. A term used to refer to both bicycle frame tubing and wheel spokes. Butted tubes or spokes are thicker at the ends and thinner in the middle. Bicycle frame tubes are typically internally butted, meaning the outer diameter remains the same while the inner diameter is reduced towards the center of the tube, making the ends stronger where the forces and stresses are the most severe and the center lighter where the forces are less severe. Carbon filaments used with a resin, in a technology similar to fibreglass. The resulting composite material is very strong in the direction that the fibers run in. Carbon fiber is available in the form of tubing with a woven/braided weave, which can be glued into lugs to build more-or-less conventional frames. A more sophisticated approach is to lay up the carbon fiber cloth in a specific shape, in a mould the shape of the finished bicycle. This allows the orientation of the fibers to provide strength in the direction of the actual stress. A cluster of chainrings or sprockets on the rear wheel hub of a bicycle. The forming of bicycle parts by pouring molten metal into a mould. A guide used surrounding the crank's chainrings to keep the chain from skipping off of the chainrings. These are typically used in Downhill, Dirt Jump and Freeride applications where the chain is subject to more bumps and hits that could otherwise derail the chain. The tubes on a bicycle's frame between the rear wheel's hub dropouts and the bottom bracket. A steel alloy made with the adddition of Chromium and molybdenum. Clydesdale is a term used at races and in cycling terminology to define the class of larger riders, typically over 235lbs. Big dudes. A suspension shock that is sprung with a spring. A bike used for commuting or getting to and from wherever one might need to go. Also used to describe the type of person to ride said bikes. Kona produces a wide range of bikes that are excellent for commuting, most of which found in our Asphalt line of bikes. Also known as race bikes, these bikes have the best components, frames and builds for the ultimate in competition riding. Components are the parts on a bicycle such as the bar, stem, pedals, drivetrain, etc. A bicycle frame also consits of parts like the top tube, down tube, seat tube, dropouts, bottom bracket, etc., which are referred to as frame components. This controls the rate at which a shock compresses. Cross-country is one type of off-road racing or competition cycling where the ideal bikes are typically light and built specifically for speed. Kona manufactures several hardtail and full-suspension bicycles made specifically for this type of racing. Cyclocross is a type of off-road racing that is typically muddy and filled with obstacles that force the riders to dismount and shoulder their bikes and running several times per lap. Cyclocross bikes resemble road bikes, but have custom geometries and parts specific to the rigours of this type of racing. D.O.P.E. stands for Drop Out Performance Enhancement. The technology was developed by Kona & Brake Therapy and offers an improved floating brake system that eliminates brake feedback (braking that causes the suspension to compress) while suspension is working. The system also offers the ability to fit several rear hub types and remains in the frame during wheel removal. The device used to change gears by moving the chain up and down on the sprockets. Front derailleurs move the chain up and down the front chainrings and the rear derailleur does the same on the rear wheel's cassette or cluster of sprockets. The part of the frame to which the rear derailleur is bolted to. This piece is described as the derailleur hanger only when this part is separate and replaceable on the frame, otherwise, when this piece is solid and built into the frame, it is referred to as a dropout. A Kona bicycle platform as well as the name of the application for the bikes in this platform. Dirt Jump refers to jumping bikes on take-offs and landings made of, you guessed it, dirt. Brakes that use a metal disc and a cable or hydraulically actuated caliper containing brake pads to squeeze the disc and stop the wheel from rotating. Disc brakes are known to be extremely powerful and effective in all sorts of riding conditions, wet or dry. A type of competition racing where the courses are typified by fast, steep descents, often with many obstacles. Kona downhill race bikes like the Stab Deluxe and Stab Supreme feature 8-inches of front and rear wheel travel, large diameter disc brakes and strong components for this fast and abusive type of riding. The parts of a bicycle responsible for its forward propulsion and gear selection. The parts in the drivetrain include cranks, chainrings, chain, cassette, and front and rear derailleurs. Parts at the rearend of a bike frame that are designed to hold the rear wheel's hub. Bicycle forks also have dropouts to hold the front wheel hub. A bicycle with suspension shocks and wheel travel on both the front and rear wheels. A type of riding very much like all-mountain or backcountry where the bike and rider are meant to "endure" all types of riding conditions. Enduro bikes typically have 140mm of wheel travel or more. A bicycle that does not use a freewheel and does not coast. The rear sprocket is "fixed" to the rear hub and all pedalling, whether forward or backward, results in the rear wheel moving. This type of bike was formerly used for track style competition riding, but has since diversified to include city riding and commuting applications. A rear disc brake where the caliper, which contains the brake pads and squeezes the disc brake to stop the wheel from turning, is not fixed to the frame, but instead "floats" on a structure separate to the frame in order to keep the braking forces from affecting or actuating rear suspension. See D.O.P.E. System. A process used to form metal parts that involves heat and pressure to align the grain structure in a material. Forged parts are known to be strong and durable. A type of bicycle riding known for stunts, jumps, drops, steep descents and very technical terrain. The front part of a bicycle that contains the head tube, top tube, down tube and seat tube. The geometric angles in which a bicycle frame's tubes are welded together. The geometry of a bicycle effects it's handling and ride characteristics. A recinforcing piece of material welded to a high stress area (or areas) of a frame. A bicycle with front suspension only. The term comes from motorcycles with no rear suspension that were referred to as hardtails. 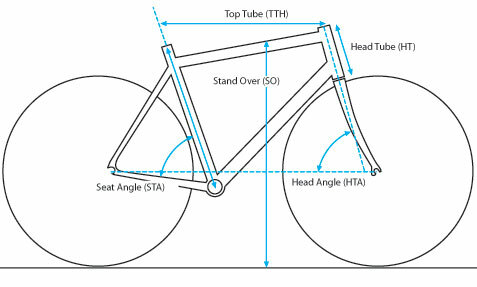 The angle at which the head tube (front most tube) of a bicycle frame is aligned. Typically slacker head tube angles are used on bikes meant for high speed and steep terrain, whereas steep head tube angles are meant for flatter terrain and better lower speed handling. A frame tube forming technology where a liquid is used to form the shape of a tube very much like a forging, but using high pressure liquid, as opposed to heat and pressure, to form the material and align its grain structure. A headset type in which the top and bottom cartridge bearings are pressed directly into the head tube of the frame. Integrated headsets have the advantage of a lower stack height, since the bearings are contained inside the frame, as opposed to a standard headset, which has cups pressed into the frame, with the bearings resting in those cups, above and below the head tube. A headset type where the cups are pressed into an oversized head tube, and the bearings rest in those cups. The bearings are not visible and the low stack height is maintained. Kevlar is a material used in all sorts of industrial applications, but most often in bicycles as the bead material in tires. The bead is the part of the tire that hooks onto the rim. Kevlar beads are often referred to as "folding" beads because unlike conventional wire beads, Kevlar can fold without affecting the integrity of the bead. Kevlar is used mainly in this application for its weight savings. Klunker is the name that was given to the first generation of mountain bikes. These bikes, born in Marin County, California, were typically a hodge-podge of motorcycle and road bike parts used for the puspose of riding off-road. The ratio of rear wheel travel compared to actual travel of the shock itself. A type of suspension set-up where the force required to compress the shock is the same from the start of the shock stroke through to the end. A type of bicycle frame where the main tubes' male parts are welded into lugs which act as female parts at the head tube, seat tube and bottom bracket intersections. A type of construction incorporating a computer programmed machine tool to automatically remove material and shape bicycle and frame components. Magnesium is an element on the Periodic Table. In the case of bicycles, magnesium is used in applications where stiffness and lightweight are required. In the case of Kona bicycles, many rear suspension rocker plates are made of magnesium for improved suspension perfomance, efficiency and lightweight. Bicycles designed specifically for use off-road. A region on the Pacific west coast of British Columbia known for pioneering the freeride movement due to its steep terrain, gnarly roots, rocks and muddy, slippery conditions. Also referred to as rake, the offset of a fork is the distance the fork dropouts are placed forward of the steering axis. A term used at Kona that refers to all sorts of extreme biking applications, synomymous with Freeride. Racks fixed to a bicycle frame used to carry bags and cargo. The type of bags used with pannnier racks, typically on bicycles designed for long distance touring like the Kona Sutra. A melding of people who care about pedals and human beings. A Pedaltarian is a person working to improve the world and the state of mankind through cycling. At Kona, we are all Pedaltarians. A type of disc brake mount where the caliper, or the caliper's adaptor, depending on disc rotor size, is mounted to two posts on the frame or fork. The initial force placed on a shock spring. A type of suspension where the amount of force required to move a shock from the beginning of its travel through to the end of it's travel becomes progressively greater as the shock compresses. A type of bike racing or training course where no pedalling is allowed. The cyclist pumps the transitions and corners to propel the bike throughout the course after an initial ramped start. A term used at Kona to describe our method of building bikes for very specific pusposes such as dirt jumping, commuting, carrying large loads, touring, racing of all sorts, etc. Kona's line of ultra light race components and frame materials. Rebound dampening controls the rate at which the shock will extend. The rear triangle is the triangle formed on the rear end of the bike consisting of the chainstays, seatstays and seat tube. A type of brake where the brake pads squeezes the wheel rim in order to stop them from spinning. At Kona we refer to road bikes typically as those with drop bars and skinny tires that are meant solely for on-road applications. Rockers, rocker arms or rocker plates are parts in a Kona frame's suspension system that interface between the seatstays and the shock, literally rocking upward in the rear triangle as the rear wheel moves in the suspension travel, downward in the front triangle as the shock gets compressed. Scandium is an element on the Periodic Table that is added to aluminum to create ultra light alloys which exhibit the best ride quality characteristics, strength and stiffness. The material is used extensively in the construction of many Kona bicycle frames. The angle at which the seat tube of the bike is aligned. The tubes in a bicycle frame that join the rear dropouts to the seat tube, or in the case of Kona 4-Bar suspension models, the dropouts through to the rockers at the rocker yoke. The amount the shock compresses with a rider sitting on bike in a normal riding position. Sag should usually be 15% to 25% of total shock travel. Cross-country: 15% to 25% suggested, Downhill 25% suggested. The total amount the shock compresses. A bicycle with only one speed or gear. A type of trail where the path is only wide enough for one bike. A downhill stunt obstacle course where riders choose their lines down the course, picking which stunts to ride. The specs are the list of bicycle components or specific parts for any given bicycle. The amount of force required to compress a spring one inch. The amount of space between a rider's inseam and the top tube of the bicycle frame. A type of material used in bicycle frame and component manufacturing. Steel is extremely resilient and comfortable to ride. It is also the most widely used material worldwide for bicycle construction, mainly because it repairs very easily. The steerer, or steer tube is the upper part of a bicycle fork, to which the handlebar stem and the turning parts of the headset attach. Riding on city streets, obstacles, skate parks and city terrain. A type of head tube and steer tube assembly where the bottom part of the steer tube measures 1.5" in diameter and the top tapers to 1-1/8". The 1.5" juncture at the bottom accommodates larger bearings and a larger steer tube to increase stiffness, strength and impact resistance. A type of racing where riders race solo or in teams and are timed over a set course, the winner being the rider or team to complete the course the fastest. A type of long distance cycling that typically involves packed gear and supplies on pannier racks. A type of off-road riding typified by terrain consisting of trails of different varieties. Trail is often used syonymously with cross-country. The shock absorbing movement of the front or rear wheel of a bicycle in reaction to the terrain being ridden. A type of race where athletes first swim, then bike, then run. The bicycle equivalent of a Sport Utility Vehicle, one capable of all sorts of useful tasks like transporting oddly shaped cargo, extra passengers or anything else you can imagine. Women-specific bikes are designed with the needs of women in mind. Things like smaller diameter grips to fit smaller hands, specially shaped saddles to fit a woman's sit bones, handlebar widths and shapes to fit a woman's reach and frames designed to better fit a woman's body proportions are all cutomised on a women-specific bicycle. A bridge that, on Kona bikes, is typically forged and helps reinforce a juncture of tubes for added torsional strength and stiffness. Many Kona hardtails employ a chainstay yoke where the chainstays meet the seat tube. This helps keep the rear triangle of the bike torsionally stiff, ensuring that pedalling energy goes directly into propelling the bike and no energy is wasted twisting the frame. Yokes are also used on Kona bikes where the seatstays meet the rockers. In this case, the yoke is meant to transfer forces from the seatstays to the rocker and into the rear shock, ensuring that all bump forces are transferred directly to avoid being relayed elsewhere in the frame.